A little basket that has made a big difference! Hey everyone! 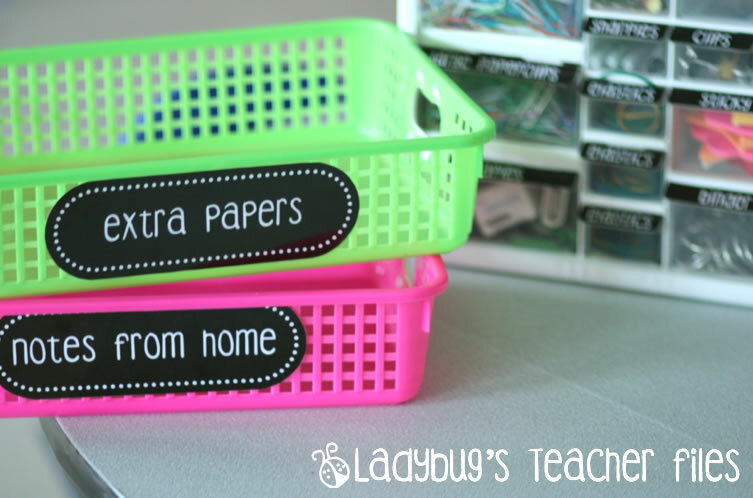 I wanted to share something that has been a huge help in my class this year…my Notes From Home basket! I can’t believe I had never done this in the past, but I honestly never kept a designated place for parent notes, fieldtrip forms, picture money, and all of that!! I just always took the forms on the fly, in the midst of greeting and attendancing (we seriously need a computer dictionary that recognizes our teacher lingo and doesn’t make those red error lines!) and other busy morning activities. Well, this summer I decided I couldn’t face the papers flying at me in the morning anymore…so I made this designated basket. And it has worked like a charm! I no longer touch any papers from home first thing in the morning…I just ask the students to put them right in the basket. Then, during specials, I take the time to sort through and organize these important items. So, pretty simple, but I did want to share–just in case you would like to try the same (though I’m sure you are much more organized and already thought of this). I have a template for Notes From Home below, plus some editable labels that I shared back in the summer here: Editable Black Labels. What are some little organizational tricks you’ve used that have made a big impact in your classroom? I would love to learn some new ideas! They look great! Super idea! Kristen I know what you mean. This year I too for the first time implemented something very similar instead I have incoming and outgoing baskets. I keep them not too far from the door. They are working great!!! I use the outgoing basket for school distributed notices, and it is helping me so much. I'm not forgetting to send home a notice and if I do of course one of my lovely students will remind me. Love! I call mine "The Important Paper Bin." oooh I like that name! Kristen, I have an "inbox" basket and an "outbox" basket on top of my mailboxes. That way I can collect incoming things and I have a place to put the things that need to go home in folders. Before this system I used to get those flyers and just set them down and forget to send them homw. When things are in the "outbox" basket, it is a great visual! I like that a lot Lori, thanks! Your new morning routine sounds just like mine! Hey, where did you get those cute baskets, I can only find those in primary colors. thanks! They are from Really Good Stuff–they have a bunch of colors! Great idea! I think I need one for my class. Thanks! I've had a notes from home bin for the past few years and it has made my life so much easier! I get all the important information right away in the morning, without my students waving papers in my face. I even used your editable labels this year when I made my baskets! My littles always try to shove their agenda/planner in my face as soon as they enter if there's a parent note written inside- I bought a slightly deeper box than yours just in case there's multiple agendas that need my attention, but regardless it works the same way. 🙂 My school is big on making sure all communication is in the student agenda- keeps notes from getting lost I suppose. I call it my "must see" basket. Thanks for the editable labels 🙂 Those are always handy to have! Great idea Kristen! Those notes are such a time sucker right in the morning sometimes. Great way to handle them. Love it, where did you get your little baskets?? Thanks Hollie, they are from Really Good Stuff. I love them! I do the same thing!! Only, my students keep money and notes in a zipper pouch in our take-home folders, and then my aide goes through them and gives the stuff to me. I have a bin on my desk and I sort through it during prep! This is a great idea that prevents piles of papers first thing in the morning! I call my bin the "Teacher Mailbox". Your labels are much cuter than mine though! Thanks for sharing! HOW have I never thought of this before?! Duh! I've always grabbed them, thrown them "somewhere" on my desk and then fumbled around trying to sort everything out later. Sometimes it's the simple things, right? I use an actual mailbox that sits on the end of my desk. I bought it from my local hardware store a few years back for around $40, dollar stores might even sell them cheaper. It works well as the children love posting their notes from home into the little slot at the front and it keeps everything together until I have the time to read through them. Thanks so much for the freebie. You always create such great looking products. I love how clear and modern looking they are, thanks for sharing. Great idea! I have a "Drop box" for things like that! Thanks for sharing!! I think this would really make a difference in my classroom too! I hope you have a great weekend!! Leave it to my girl, Kristen, to take a simple concept and make it look fabulous! I love it (as always)! Such a great idea. Sometimes it gets so chaotic in the morning when students are handing in a variety of forms and having them in one place is so helpful! Fabulous idea, Kristen!! I definitely need to get me one of these baskets! Usually I just tell my kiddos to put their notes on my desk and then I have a bunch of random notes all over! I just wanted to let you know that I used your editable labels and ideas for turning in homework this year, and it has changed my life. Morning routines run so much smoother. It's amazing what a few colored bins and some labels can do for a classroom. Thank you for always sharing your tips and tricks! :)! !